How many children, old people, and law-abiding citizens have to be injured, terrorized or killed before we call a halt to the growing rash of police violence that is wracking the country? How many family pets have to be gunned down in cold blood by marauding SWAT teams before we declare such tactics off limits? And how many communities have to be transformed into military outposts, complete with heavily armed police, military tanks, and “safety” checkpoints before we draw that line in the sand that says “not in our town”? The latest incident comes out of Atlanta, Georgia, where a SWAT team, attempting to execute a no-knock drug warrant in the middle of the night, launched a flash bang grenade into the targeted home, only to have it land in a crib where a 19-month-old baby lay sleeping. The grenade exploded in the baby’s face, burning his face, lacerating his chest, and leaving him paralyzed. He is currently in the hospital in a medically induced coma. If this were the first instance of police overkill, if it were even the fifth, there might be hope of reforming our system of law enforcement. But what happened to this baby, whose life will never be the same, has become par for the course in a society that glorifies violence, turns a blind eye to government wrongdoing, and sanctions any act by law enforcement, no matter how misguided or wrong. Indeed, as I detail in my book A Government of Wolves: The Emerging American Police State, this state-sponsored violence is a necessary ingredient in any totalitarian regime to ensure a compliant, cowed and fearful populace. Thus, each time we as a rational, reasoning, free-minded people fail to be outraged by government wrongdoing–whether it’s the SWAT team raids that go awry, the senseless shootings of unarmed citizens, the stockpiling of military weapons and ammunition by government agencies (including small-town police), the unapologetic misuse of our taxpayer dollars for graft and pork, the incarceration of our fellow citizens in forced labor prisons, etc.–we become accomplices in bringing about our own downfall. There’s certainly no shortage of things to be outraged about, starting with this dangerous mindset that has come to dominate law enforcement and the courts that protecting the lives and safety of police officers (of all stripes) is more important than the lives and safety of the citizenry. This is true even if it means that greater numbers of innocent civilians will get hurt or killed (police kill roughly five times more often than they are killed), police might become laws unto themselves, and the Constitution will be sidestepped, or worse disregarded, at every turn. For example, where was the outrage when a Minnesota SWAT team raided the wrong house in the middle of the night, handcuffed the three young children, held the mother on the floor at gunpoint, shot the family dog, and then “forced the handcuffed children to sit next to the carcass of their dead pet and bloody pet for more than an hour” while they searched the home? Or what about the SWAT team that drove an armored Lenco Bearcat into Roger Serrato’s yard, surrounded his home with paramilitary troops wearing face masks, threw a fire-starting flashbang grenade into the house in order, then when Serrato appeared at a window, unarmed and wearing only his shorts, held him at bay with rifles? Serrato died of asphyxiation from being trapped in the flame-filled house, and the county was ordered to pay $2.6 million to Serrato’s family. It turns out the father of four had done nothing wrong; the SWAT team had misidentified him as someone involved in a shooting. Even so, the police admitted no wrongdoing. And then there was the police officer who tripped and “accidentally” shot and killed Eurie Stamps, who had been forced to the floor of his home at gunpoint while a SWAT team attempted to execute a search warrant against his stepson. Equally outrageous was the recent four-hour SWAT team raid on a California high school, where students were locked down in classrooms, forced to urinate in overturned desks and generally terrorized by heavily armed, masked gunmen searching for possible weapons that were never found. This battlefield mindset has so corrupted our law enforcement agencies that the most routine tasks, such as serving a search warrant–intended to uncover evidence of a suspected crime–becomes a death warrant for the alleged “suspect,” his family members and his pets once a SWAT team, trained to kill, is involved. Unfortunately, SWAT teams are no longer reserved exclusively for deadly situations. Owing to the militarization of the nation’s police forces, SWAT teams are now increasingly being deployed for relatively routine police matters, with some SWAT teams being sent out as much as five times a day. For example, police in both Baltimore and Dallas have used SWAT teams to bust up poker games. 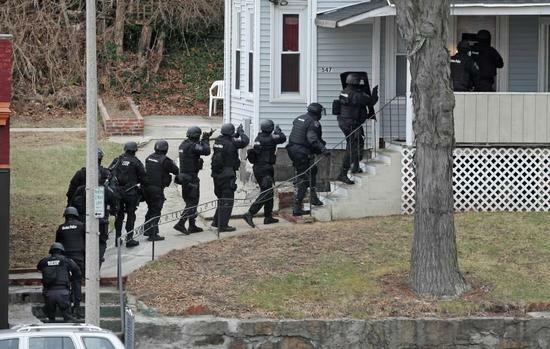 A Connecticut SWAT team was sent into a bar that was believed to be serving alcohol to underage individuals. In Arizona, a SWAT team was used to break up an alleged cockfighting ring. An Atlanta SWAT team raided a music studio, allegedly out of a concern that it might have been involved in illegal music piracy. Yet the tension inherent in most civilian-police encounter these days can’t be blamed exclusively on law enforcement’s growing reliance on SWAT teams. It goes far deeper, to a transformation in the way police view themselves and their line of duty. Specifically, what we’re dealing with today is a skewed shoot-to-kill mindset in which police, trained to view themselves as warriors or soldiers in a war, whether against drugs, or terror, or crime, must “get” the bad guys–i.e., anyone who is a potential target–before the bad guys get them. The result is a spike in the number of incidents in which police shoot first, and ask questions later. Who could forget what happened to 13-year-old Andy Lopez? The teenager was shot seven times and killed after two sheriff’s deputies, a mere 20 feet away, saw him carrying a toy BB gun in public. Then there was the time two Cleveland police officers mistook the sounds of a backfiring car for gunfire and immediately began pursuing the car and its two occupants. Within 20 minutes, more than 60 police cars, some unmarked, and 115 officers had joined the pursuit, which ended in a middle school parking lot with more than 140 bullets fired by police in less than 30 seconds. The “suspects”–dead from countless bullet wounds–were unarmed. Miriam Carey’s family still can’t get past the shock of her death. Police in Washington, DC, shot and killed the 34-year-old woman after she collided with a barrier leading to the White House, then fled when pursued by a phalanx of gun-wielding police and cop cars. Carey’s 1-year-old daughter was in the backseat. Seventeen gun shots later, Carey was dead and her toddler motherless. Just as troubling as this “shoot first, ask questions later” mindset is what investigative journalist Katie Rucke uncovered about how police are being trained to use force without hesitation and report their shootings in such a way as to legally justify a shot. Rucke reports the findings of one concerned citizen, “Jack,” who went undercover in order to attend 24 hours of law enforcement training classes organized by the private, for-profit law enforcement training organization Calibre Press. According to the learning materials, ” there isn’t time for logic and analysis, encouraging officers to fire multiple rounds at subjects because “two shots rarely stops ’em,” and outlines seven reasons why “excessive use of force” is a myth. Other lessons Jack learned from the “Anatomy of Force Incidents” training in January include a need to over-analyze one’s environment for deadly threats by using one’s imagination to create “targets of the day” who could be “reasonably” shot, to view racial profiling as a legitimate policing technique, even if the person is a child, pregnant woman or elderly person, and to use the law to one’s advantage to avoid culpability. If ever there were a time to de-militarize and de-weaponize police forces, it’s now, starting at the local level, with local governments and citizens reining in local police. The same goes for scaling back on the mindset adopted by cops that they are the law and should be revered, feared and obeyed. Police have been insulated from accusations of wrongdoing for too long and allowed to operate in an environment in which whatever a cop says, goes. The current practice is to let the police deal with these transgressions internally by suspending the officer involved with administrative pay, dragging out the investigation until the public forgets about the incident, and then eventually declaring the shooting incident justified based on the officer’s fear for his safety, and allowing him to go back to work as usual. And if, on the off chance, a shooting incident goes before the courts, the judiciary defers to police authority in almost all instances. Just recently, for example, the U.S. Supreme Court declared that police officers who used deadly force to terminate a car chase were immune from a lawsuit. The officers were accused of needlessly resorting to deadly force by shooting multiple times at a man and his passenger in a stopped car, killing both individuals. Meanwhile, the epidemic of police violence continues to escalate while fear of the police increases and the police state, with all its surveillance gear and military weaponry, expands around us.